Come on now…Compasses are cool. There is just something about them, something that draws you to them, sparks imagination and the adventurous spirit. The compass is important to so many; really who wouldn’t want this gorgeous piece in a prominent spot in their home? The Wilderness Compass is a hand carved 8 Inch Ceramic Art Tile representing the land, sea, earth and sky. I’ve always been drawn to compasses. The symmetry is appealing all on its own and it’s a tool that I use often when I venture into the outdoors, but it is more than that. For me, the compass is the symbol of exploration and adventure; the knowledge that there is more out there to see and experience that you can’t reach by car. Researching this piece, I discovered that the compass symbol means so many different things to many people. The compass itself is a symbol of guidance, the ability to point you in your true direction. A gift of adventure and travel, but guide you safely home. The cardinal directions have their own symbolism in many cultures. Did you know that North means earth, home, security, infinite possibilities, wisdom and thought. South means the present, purity and beginnings, fire, energy, passion and creativity. West symbolizes water, emotion, pysche, movement, and the past. East is the air, communication, the present, salvation and spirit. When you install the Wilderness Tile into your kitchen back-splash or fireplace surround, you don’t have to install the tile with North up. Align the compass to true north where you live so that it may always guide you safely home. 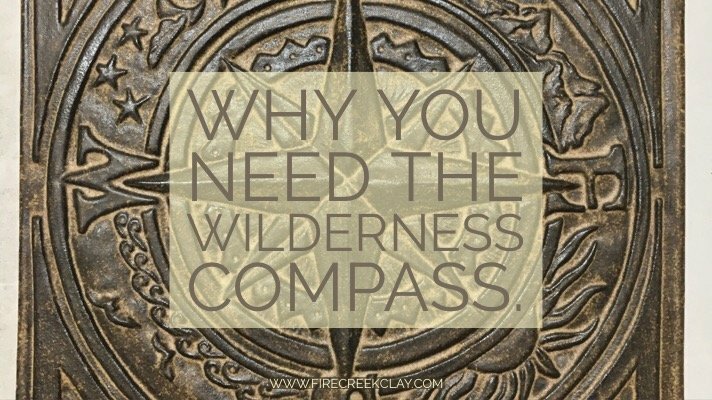 Perhaps align the Wilderness Compass with the cardinal direction that symbolizes what is important to you. Are you seeking wisdom? North is your guiding star. Maybe you seek creativity, install the Wilderness Compass with South in the prominent position. What does the symbol of a compass mean to you? Tell me all about it below! Fire Creek also has a 6 inch Sun Compass and more 6 inch Compass designs coming soon.